What do we believe about each of these areas? Have we noticed that what we believe has probably changed over time? Do we even realize it? And what criteria did/do we use to establish what we believe? How attached are we to what we believe? How do we know that what we believe is true? Do we believe something to be true because we know it or because someone told us to believe it? Of the three categories previously stated, what we believe about ourselves has the most impact on our lives because what we believe about ourselves, we experience and project out into the world. When we believe that we are “not enough”, it becomes our experience materially and in everything we do. It cleverly disguises itself as “lack” in many areas of lives. When we believe ourselves to be good at doing “something”, we experience opportunities that allow us to do that “something” in a variety of ways which also allows us to develop that “something” into something even greater. So the question becomes: what do we believe to be true about ourselves? And is it true? How do you know it’s true? Byron Katie created “The Work” which beautifully and simply gives us a way to explore this very line of questioning in dealing with our thoughts. In relation to this month’s mandala, we can easily adapt these questions to focus on what we “believe”…which we actually turn into thoughts. do we “see it when we believe it”? More and more, evidence exists that what we believe to be true manifests itself as truth. If we believe that we always forget people’s names, then we always forget people’s names. If we believe we can’t do something, then we can’t do it. If we believe that “those people” are bad people, then we’ll only experience “those people” doing bad things. When we change what we believe (“I always remember people’s names”, “I finish tasks on time”, “these people do wonderful things”), our experiences begin to match what we now believe…partly because we also begin to change our behavior (consciously or unconsciously) to be in alignment with what we believe. How cool is that! Change what we believe and we change our experience! 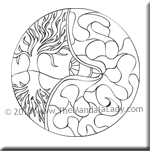 Let’s ponder this as we color this month’s mandala. Be sure to download this month’s section of the 2015 Mandala of the Year. cant thrill myself about my voice but im attempting.